Hamburg: Swinghop im Mandalay | HopIt! 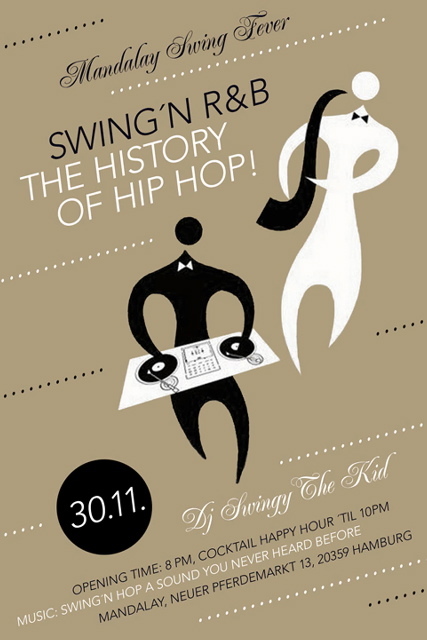 at 30.11. i try to play the roots of hip hop and i mix it up with Swing´n R&B. Let us discover together a new sound!! We´ll rediscover our rhythm emotion and let him rise again on the dance floor…at the Mandalay. I look forward to many dancers, Lindy Hopper, Hip Hopper, Breakdancer and all the other dancers.